#MySundayPhoto this week is a bit of a visual metaphor: a rather gloomy looking shot of Brighton’s abandoned West Pier taken from the British Airways i360, the tallest moving viewing tower in Europe. It’s been a bit of a rubbish start to the year in our house – for reasons I may or may not expand on at a later date – so it was nice to leave the ground behind and head up into the sky. 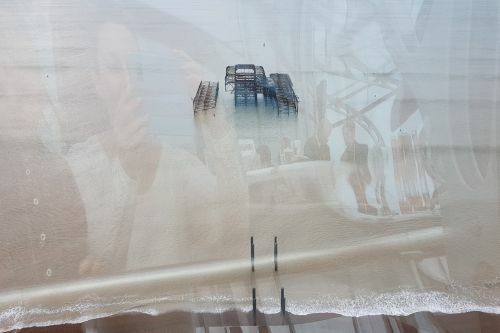 If you haven’t heard of the i360 before think glass spaceship (which is why you can see my reflection) that moves up and down a (very high) pole. The view is really quite amazing, and you see the world from a completely different perspective. How is 2018 treating you so far? Have you had a good or a bad start to the year? Love that image! I’m a bit scared of heights (despite my hot air ballooning background) but if I’m ever in Brighton I might give it a go.